When Trondr Nefas passed in 2012 it effectively meant the end of the different bands and projects he was involved in. It is, however, evident he was producing quality black metal until the very end and left substantial amounts of demo recordings behind. Last year Nefas' long-time partner in Urgehal, Enzifer, gave that band a fitting swansong by properly recording Nefas' newly written songs using a series of guest vocalists in the absence of Nefas' voice. The result was one of the best albums of 2016 and a fitting testimony to Nefas' outstanding skills as a song writer. Now the time has come for yet another set of songs signed Nefas to see the proper light of day. This time it is Nefas' partner in Beastcraft (where Nefas was called Alastor Nefas), Sorath Northgrove, who has discovered a slab of demo recordings intended for Beastcraft. The information given in the press statement does not specifically state if these demo recordings were produced around the time of Nefas' demise or the result of earlier efforts, but I suppose that is mostly of academic importance. I have to admit to being unfamiliar with Beastcraft until this effort crossed my paths. However, I do enjoy the vocals Northgrove lent to one of the songs on last year's Urgehal album. As Northgrove has delivered the vocals on all Beastcraft albums, this promised a more coherent experience than the swansong of Urgehal. 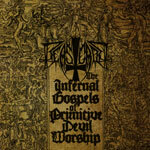 It becomes almost instantly evident on 'The Infernal Gospels of Primitive Devil Worship', that Nefas is the mastermind behind the songs presented. The riffs and guitar lines bear his trademark and the album could best be described as a rougher, more primitive version of Urgehal or Tsjuder. In general, the songs are crude and repetitive and fits the title of the album very well. If anything, it bears the feeling of juvenile séances in dark mid-winter Norwegian forests. An echo from a past when the Norwegian sound was shaped in a blaze of darkness and burning churches, all wrapped in a rough fitting production. Even though I find the repetitive style appealing and every single song on this album promises pure greatness, it is evident the album would have needed some polishing in the studio. Most of the songs would have benefitted greatly from some small amounts of variation. Not entire passages of new riffs, but simply some extra hooks and twists added here and there to the song structures present. As of now, the album comes off as more of a bunch of ideas, although pretty great ones, than fully composed songs. Nevertheless, Sorath Northgrove deserves all the credit for making these songs see the light of day. 'The Infernal Gospels of Primitive Devil Worship' delivers exactly what is promised: a string of primitive, aggressive black metal tunes spawned from the fires of damnation. Even though it would have benefitted from some further work before being recorded it is recommended for everyone who truly misses the creative genius of Nefas.